If you are a traveler or someone who spends days drenched in sunlight, you would be smart to wear a sun hat during your trips or activities. A sun hat is more than just an accessory to your outfit. Acting as a barrier, a sun hat protects you from the harsh rays of the sun and other harmful elements of the environment. The Shape Flexer sun hat is designed to offer unmatched quality, resilience, and portability. Coming in different hat styles and colors, our sun hat is also tailored to a wide range of tastes and lifestyles of our customers. If you need a durable, protective hat to beat the summer heat, purchase our Shape Flexer sun hat. The multiple features of our sun hat can give you peace of mind knowing your dollar is well spent and your scalp is properly protected. A sun hat helps protect you from the harmful rays of the sun. This is an obvious one and the most important benefit of a sun hat: sun protection. When you get too much sun exposure, UV rays are able to reach your inner layers. This situation is called sunburn, which can do serious damage to your skin cells and cause them to die or even develop cancer. Luckily, you can prevent these occurrences with a sun hat. A sun hat gives you enough shade in hot, sunny weather and protects your face from UV rays. As a result, you get to protect yourself, maintain the good health of your skin, and even give your getup a stylish edge with a sun hat. A sun hat helps protect you from other environmental elements. Weather can change without warning on your trip, and you want to be ready when this happens. One way of being prepared is by wearing or bringing a sun hat with you. A sun hat can protect your eyes from strong winds and the dust they carry. Additionally, you can use a sun hat to keep the water off your face or gear when there is a torrential downpour. A sun hat adds character to your outfit. Besides protecting you from the sun, a sun hat can do wonders for your style and appearance. Wearing a sun hat while you brave the canyon lands or trek to the peak of a mountain can make your poses in pictures look instantly cooler. If you do not feel like having a sun hat on your head, you can always let it dangle at your back using its adjustable band. A sun hat allows you to hide from the sun or curious eyes. At some point during your travel, you may want to get some rest or take a nice nap. If this is the case, the last thing you want is the sun casting a bright light on your eyelids or the nearby people watching you sleep. By positioning a sun hat over your face, you can take a break in peace and signal to everyone around that you are currently resting. This use of a sun hat especially comes in handy if you are going to a public beach or somewhere that is crowded. Are you looking for the best hat to wear on your trip? Switch to Shape Flexer today, and purchase your portable, durable, and wind-resistant sun protective hat. At Shape Flexer, we strive to offer high-quality products that will give you the most value for your money. Contact us to learn more about our all-purpose and all-weather hats. At Shape Flexer, we have the sun hat that can enhance your getup and provide a comfortable barrier against the summer heat. 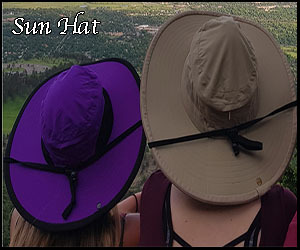 If you are searching for the right sun hat to wear during your travels, look no further than our Shape Flexer sun hat. Learn more about sun protection hats: https://www.arpansa.gov.au/understanding-radiation/radiation-sources/more-radiation-sources/sun-protection-hats.